I came across a bunch of my newsletters from when I was in Japan. Considering Halloween is fast approaching, I thought it timely to repost this – my thoughts on Halloween as a Christian. This was originally dated 10/29/08. Take it as you will. Some of you might not agree with what I am going to say in the following paragraphs, but I hope that you will at least read it with an open mind. This Friday is Halloween. People everywhere will be celebrating it, and Japan is as well (although they embrace it because it’s something American, and they don’t really do the trick-or-treating but they do have a lot of parties). 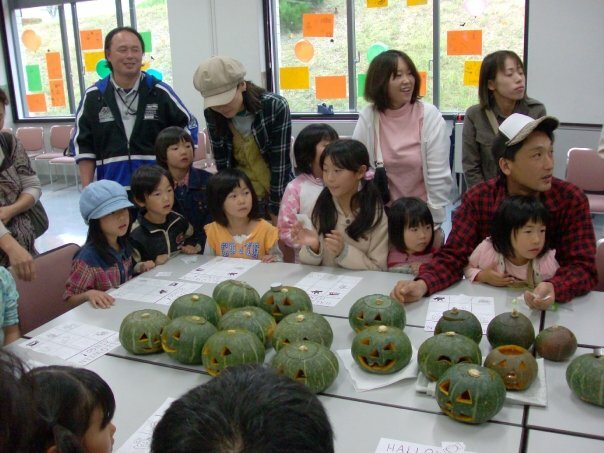 On Sunday, I helped out with a Halloween workshop for some kids near Yamaguchi City. It was a lot of fun! I really enjoyed helping them carve the pumpkins and playing the games. 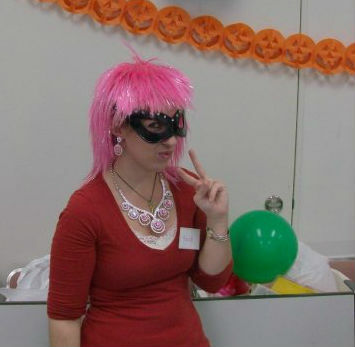 We always celebrated Halloween when I was a kid, and I would even dress up when I was up to high school. There’s just a fun atmosphere around the holiday. Now, I know a lot of people do not like to celebrate it because of its origins. I completely understand, and if that was what Halloween was in these days as well, then I would not want anything to do with it. But the truth is that it has changed. For the majority of people who enjoy it, it is not about worshipping spirits and divination or kidnapping little children and boiling them in stew (although that makes a really good scary story). It’s the one night of the year that people all over are willing to put down their guard a bit and actually meet their neighbors with their children. Some might say, “Well, it’s just not an important holiday for a Christian. We have Christmas, Easter, Thanksgiving…Those days are so much more important for us to celebrate, we can forget about Halloween and no one will hold to our discredit.” But I want to ask you…do you know your neighbors? You might know their last names from their mailbox, you know how many cars and kids they have, how late they keep their dog out at night, but do you know how their parents’ health is doing? Are they struggling to keep their marriage together? Did they just move here and have no connections with anyone except at their workplace? I think God has given us a great opportunity. Most people who are not Christians think that Christians are stodgy and cannot have any fun. They see a Christian’s closed and darkened house on Halloween and think that they have no interest in the community. I am sad that I can’t be home this year to hand out candy, to show my neighbors my face so that they can know that I am not some religious freak incapable of real human interaction. Yes, we know that we are very social creatures, within the safety and protection of our church community, but are you willing to step outside of that and invite some less than savory (or so you think) people into your life…people who are not already following Christ? There is a special blessing for someone who leads another to Christ. Oh, and by the way…I looooove how some churches do the “Trunk or Treat”. It provides a nice, safe, environment for kids to get candy and play games. Last year, Mom’s church did that, but we still sat at our home and handed out candy. As the kids came by, we let them know that they should go over to the church to get a lot of candy. It was a great way to get people over to the church and see Christians actually enjoying life and in a non-threatening setting. Just throwing some ideas out there for you…and again, if you don’t agree with this, please don’t hate me. We have different ideas of evangelism and different people are gifted for different things. Some of you, I know, do not celebrate Halloween, but you also make it a point to know your neighbors and be involved in your community. If that’s the case, then good for you! But if you are a regular “church hermit” and don’t know anything about the people down the street from you, I would just suggest that you should find a way of doing so. It is a command that Christ gave us – to love your neighbor as yourself. Can you say you do that? I know I sure don’t…but it’s something I am working on. The Huz and I will be passing out candy this year at The House. I’m super pumped for it! He said that we don’t get many kids down this street, but I am looking forward to it. We never had many kids at my mom’s, but it was worth seeing the kids and neighbors for a little bit. We are all so isolated in America! Ugh, it drives me nuts and yet I perpetuate it all the time. 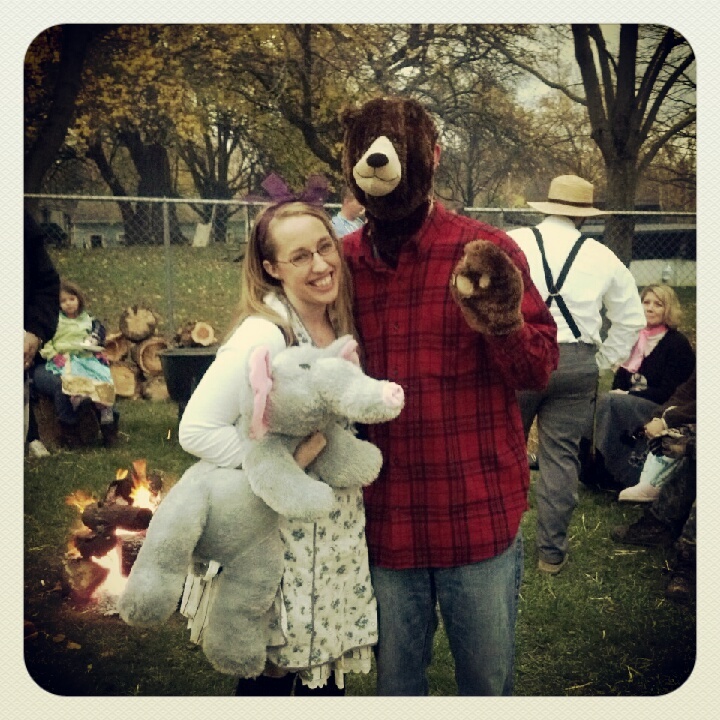 Halloween costumes last year…Goldilocks and a bear. What are you doing for the holiday? Handing out candy? Taking kids around? Doing something with your church for the community? I’d love to hear how you use the holiday to reach out to others. 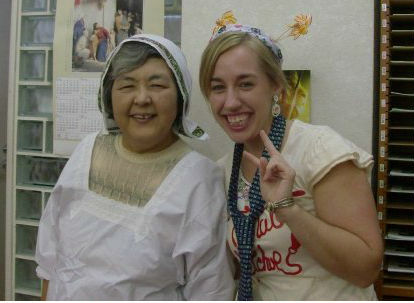 This entry was posted in Making Home, Reflections, Shimonoseki '08 and tagged Christian, Halloween, Japan, Trick or Treat. Bookmark the permalink.